"And I looked, and behold a pale horse: and his name that sat on him was Death." In 1979, Mexican moviegoers were terrified by the new sci-fi/thriller/drama El Ano de La Peste, starring Alejandro Parodi, Daniela Romo and Jose Carlos Ruiz. The film tells the story of a mysterious disease that hits Mexico City and only Dr. Sierra Genoves (Parodi) seems to notice anything going on. People fainting on the subway, more than usual cases of "bronchial pneumonia" at the city's hospitals. He warns the city government of the possibility of a epidemic in the city and a resulting pandemic. The city government decides to cover everything up. There is no plague in the city. Shocker right? Its Mexico. Nothing ever goes wrong in Mexico. In the seventies (pretty much as long as the PRI was the ruling party) NOTHING ever went wrong in the country. Sure problems here and there but "nothing serious". Ever. So in the metropolis of 18 million, nothing is wrong. Health and Sanitation crews go through the city spraying freaky looking neon yellow "disinfectant" foam on buildings, inside homes and in one memorable scene, on a group of homeless men in sitting on a sidewalk in a drunken stupor. Buildings are evacuated due to "gas leaks". Bodies are quietly picked up in garbage trucks and buried in mass graves outside the city. So Dr Sierra Genoves, while he isn't boinking his lover, hes out trying to warn people about the plague. A visiting diplomat from Norway, dies from the disease at the city airport and the news is out. Something is wrong in the city. By Christmas Eve, some 5 months after the disease is first detected, Mexico City is a dead city, a barren landscape devoid of life, trash and bodies littering the streets, its surviving residents scared of contact with other humans, gas mask wielding city police beating the mobs who demand medications. "During my term, there wasn't any, and there will be no, plague". Dr Sierra however, giving up hope, gets a flat tire in a ravaged neighborhood. He asks for helps and a passerby instead, runs away from him. Defeated, kicking trash, he walks into the night, passing debris on the street and cadavers. Reading the Breaking News on ElUniversal.com.mx on the night of Thursday April 23rd, I was reminded of this movie. I remember the scenes of residents wearing gas masks throughout the city, the gas mask wearing and billy club wielding cops beating the people who demand answers. The mass suicides at the pyramids of Teotihuacan of people imploring the Aztec gods for some sort of mercy. 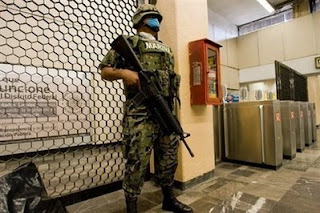 "Influenza epidemic strikes the Federal District (Mexico City) read the headline on April 23rd. Reading Influenza I remembered high school history class. The 1918 Spanish Influenza pandemic which killed more than 40 million people. Spitting in the streets became illegal. I worried when news outlets started to use the words "potential pandemic". I wondered if Mexican authorities would be truthful during a health crisis like this. I quickly realized that the answer was NO. Probably Not. You see, this epidemic of swine flu was detected as early in March and possibly as far back as December. During March and the first weeks of April, many people fell ill with what seemed was a common flu but then they died. Quickly. Healthy people woke one day fine, fell ill the next day then died days later. Dozens died. On April 23rd, the Ministry of Health broke the news. It was an Influenza epidemic in the city. But not just in the city. People started dying in villages in Oaxaca. In the city of San Luis Potosi. Then cases popped up in Hidalgo. Then Veracruz. Then Mexicali, Baja California, near San Diego. Tlaxcala state. Zacatecas state. Deaths reported in Guanajuato. The United States had reported some cases in Southern California and Texas. Then a group of high school students fell ill in New York, they had visited Cancun during Spring Break. 20 cases so far in the US. Some in Nova Scotia, Canada. Others reported in Israel and New Zealand. Almost a dozen countries reporting people stricken with Swine Flu symptoms. Then I noticed something peculiar. There was virtually no reports of the doctors and nurses who fell ill and died because of this outbreak. No attention was paid to the claims of a doctor that allegedly "dozens and dozens of people" had been dying in city hospitals since March but doctors were told NOT to report the cause of deaths as "influenza". They were told to put "heart attacks" or "pneumonia". The government death toll of 103 that stood as of April 27th, was far far too low. How many had died of Influenza but had been misdiagnosed? Maybe the doctors thought they had died from a common cold? Or flu? Or a heart attack? or pneumonia? All of the deaths have been in Mexico. All the other cases abroad have been minor, and most of the victims well on their way to recovery. Why? What was the disease so lethal in Mexico? Questions that were not answered quick enough. Where had the disease come from? Why Mexico? Was it man made? Or somehow mutated from pigs, birds and humans? How many people had died from it, since March? All year?. Questions. Only time will tell and the world is anxiously waiting and watching to see if the "Gripe Porcina" outbreak as it is called in Mexico, turns out to be the worlds next global pandemic. Will authorities in Mexico proclaim 'There isn't and wont be any plague here"? Time will tell. 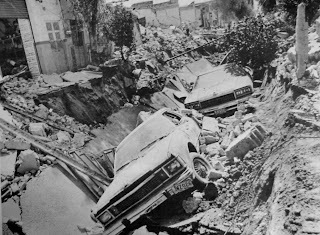 Cars lay buried in the ruins of a blown up street in Guadalajara after the Apr. 22, 1992 explosions. When they built the Colector Intermedio del Oriente under Reforma district in the southeastern part of Guadalajara, Jalisco, Mexico, they found out the sewer line would hit several subway tunnels. Rather than over, against gravity they would build the line UNDER the tunnels. Years later these errors in engineering would prove catastrophic to the city of 4 million people. The strong smell of gasoline or paint thinner wafted over the streets of Analco neighborhood in the Reforma district of the city. The April heat was hitting the city and it seemed that the hotter the day, the stronger the smell. Residents would find the smell would come from the water faucets and even the toilets. What was the source of the smell? Several residents called the city and complained.On April 20th, They called the city's water and sewer department, SIAPA. Something needed to be done, the children were getting dizzy and it was hard to sleep at night. The smell of gas was strong. On April 21st, SIAPA department workers were sent to inspect the streets of the Analco neighborhood and that night firefighters from the Guadalajara Fire Dept. found the source to be the sewers. The mysterious gasoline smell was coming from under the streets. The firemen opted for leaving a few manholes open and letting the fumes dissipate in the air rather than build up underground. Further inspection of the sewers were scheduled for the next morning, April 22nd. The city goverment decided to not order an evacuation. That would probably just cause panic among the thousands of residents of Reforma. Telling them their neighborhood was a ticking time bomb was foolish. Such panic would cost the city money. Trinidad Lopez Rivas, the city's fire chief decided not to order an evacuation pending further inspections of the city's sewer system. 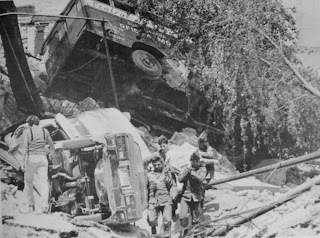 In March 1983, Sierra Morena Street had exploded, causing dozens of injuries. A nearby clinic had illegally dumped chemicals into the sewer causing the blast. Would there be a repeat of that event? It was 9 am on April 22, 1992. People drove to work, rode the city buses to and fro and children walked the streets. Vendors sold their food and drinks in little stalls on street corners in the neighborhood, a typical spring day. A group of firefighters descended into the sewer in order to find out where all the gasoline was leaking from. At 10 am, the search was called off. At that time, white steam was seen pouring out of storm drains and manhole covers were popping, shooting high into the air. The firefighters had not yet reached the surface when five minutes later, a spark, perhaps from a lit cigarette, or a pilot light, or the spark of a manhole cover being dropped into place, unleashed a huge explosion. The ground under Gante and Aldama Street exploded in a huge cloud of dust, hurling cars, buses and trucks into the air like toys and tearing people apart. Eight kilometers of street exploded, one after another. Gante Street exploded. 20th of November St. exploded, Violeta St. exploded, Rio Nilo St. exploded, Doctor R. Michel St. exploded, Corregidora St. exploded, ten huge blasts, ripping apart the streets, and blowing up the adobe homes lining them, killing almost everyone who were on the streets at the time. A city bus full of people fell into one of the trenches, its passengers killed or seriously injured. A big rig landed on top of a house. A pickup truck fell on a crowd of people pleasantly eating a snack at a taco stand. A Telmex telephone employee working on a telephone line was killed, his body cut in two. Another headless body, hung grotesquely entangled on a telephone pole. A enormous mushroom cloud of dust rose over downtown Guadalajara and the explosions sounded like thunder. Stunned witnesses wondered what was happening in the direction of the Reforma district. The emergency calls started pouring into the Red Cross stations in the city. A bus full of people had been swallowed up by a hole in the street. A whole street had exploded. 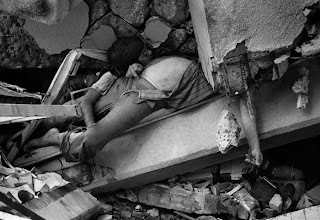 Many people were trapped inside their collapsed homes. There were bloody, dirt covered bodies everywhere. There had been in explosion. Something ghastly had happened in Analco. For an hour after 10:05 am, more explosions rocked the area. Calzada Gonzalez Gallo blew up. Calzada del Ejercito also exploded. Sometime after 12 noon, residents of the city, in fear, popped open the manhole covers to let the fumes dissipate in case there was any gas under their streets. At 1:38 PM, several neighborhoods including Mexicaltzingo, 8 de Julio, Polanco and La Nogalera as well as downtown Tlaquepaque, a Guadalajara suburb were evacuated as a precaution. Residents of the other three sectors of the city, Juarez, Libertad and Hidalgo, for fear of the entire city exploding in a mass cataclysm, hopped in their cars and fled the city to other towns or "to the hills." Residents of the Reforma borough got to work right away, digging out the survivors and carrying them on improvised stretchers; a wooden plank or a broken door. The broken bodies of men women and children were pulled out, covered in dust and some horribly mutilated and taken to a nearby stadium for identification. Ambulances drove in and out of the neighborhood all morning and afternoon. Miles of streets had exploded, following the Colector Intermedio del Oriente sewer line. 20 city blocks had blown up. But what had caused the explosion? Residents had complained of a gas smell. Now the city and survivors were asking: Why was nothing done? Jalisco state Governor Guillermo Cossio Vidaurri flew over the ravaged area. It looked as if Guadalajara had been bombed. Where streets, sidewalks and trees once were, now it was a jagged deep, debris filled trench full of rubble and cars flipped upside down or buried as if by a pissed off giant. He saw swarms of people, soldiers and police crowding over the collapsed buildings, rescuing the injured and bringing out the dead. Who was responsible for the disaster? By late evening on April 22, 180 bodies had been recovered from rubble, hundreds more injured and more than 10,000 were made homeless. A hasty investigation quickly blamed the disaster on the accumulation of volatile Hexane gas in the sewers. Leaked Hexane mixed with Methane gas, a byproduct of human waste had caused the sewers to catastrophically explode. The mayor of Guadalajara Enrique Dau Flores quickly lay blame on a cooking oil factory La Central, which was near the destroyed neighborhood. The manager of La Central told the media "I refuse to be a scapegoat in this tragedy. There has been no leaks here at the plant". Checks conducted in the blown up sewers found large pools of gasoline. The residents had complained of a "gasoline" smell not Hexane, which has no smell .President Carlos Salinas de Gortari toured the devastated area and gave an ultimatum: "The people responsable for the disaster must be found in 72 hours". The people didnt believe the city's explanation that La Central was to blame. Further investigation found the soil around a Petroleos Mexicanos (PEMEX), Mexico's Oil monopoly gas distribution plant, saturated with gasoline. The ground was wet and the stench of gasoline was strong. The gasoline pipeline from the huge Salamanca refinery in Guanajuato state to the city of Guadalajara ran nearby. The plant was also blocks away from there the explosions originated. Two pipelines had been laid together, one from one kind of metal and another from another type. This caused a chemical reaction between the two, causing them to rust and form holes. One pipe held gasoline, the other water. The gasoline leaked into the sewer through cracks in the tunnels and the pools of gasoline formed undetected for weeks. Rather than the gasoline flowing freely in the sewer they were backed up by a U shaped plug that went under a Subway tunnel. The gasoline flowed but the fumes were stuck with nowhere to go. That is when the residents began to notice the smell of gasoline. The sewers were pressurized bombs, only needing a tiny spark to set them off. In all, more than 230 people officially died in the sewer blasts with hundreds more injured. 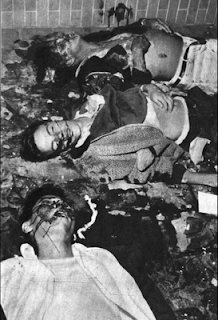 Not surprisingly as tends to happen when a disaster happens in Mexico, the survivors dispute the final death toll. Many recall seeing hundreds upon hundreds of dead, perhaps the death toll being 1,000. Photographs were published of dead bodies bearing the numbers 923 and 700, but the goverment atributted these numbers to the erroneous double counting of cadavers and bad coordination among the places storing the bodies. Several city government officials were jailed for not ordering an evacuation of the Reforma district and trying to cover up what was going on. A tragedy that could of been avoided. Mayor Enrique Dau Flores resigned as well as Jalisco Governor Guillermo Cossio Vidaurri. Now everything is rebuilt in Reforma, with a few empty fields where buildings once stood, as the sole reminders of that fateful April morning. People now tell macabre tales of seeing the ghosts of the victims late at night, screaming and crying, haunting the neighborhood where they died instantly all those years ago, when bad planning, negligence and stupidity all combined to produce the worst disaster in Guadalajara history and one of the worst industrial disasters in Mexico in recent memory. Onlookers crowd the armored truck where the assailants escaped on April 21, 1988 in Los Mochis. 4 people were killed, 12 injured in the notorious bank heist. Its 12:25 pm. Inside the Banco Nacional de Mexico (Banamex) bank long lines of customers await to deposit or withdraw money. A young woman named Rosi Padilla stands near the glass doors, smiling and greeting the customers who enter the bank and informing them of the new Invermático ATM machines that Banamex will soon be adding to this branch. On the other side of the building, bank co manager Manuel Sandoval is helping a customer. It seems like everything is peaceful; customers and bank employees proceed with their transactions. More than 50 people fill the building, busy as many take advantage of their lunch hours to go to the bank. 5 minutes later, the peace of another routine business day at the bank ends. All hell breaks loose. Exactly at 12:30 pm, 6 men enter the bank violently brandishing guns and yell "This is a hold up! Nobody move!" Only a few listen to the robbers. The rest of the people run away, desperately searching for an exit; the men are blocking the main doors. They stop running when they hear a gunshot from a .38 caliber pistol. "Nobody freak out!" yells the man who pulled the trigger, shooting his gun in the air. The rest of the gunmen take small groups of customers and employees and push them into the restrooms. Rosi Padilla the smiling cashier at the door is still standing, petrified as she sees the men yelling and threatening to kill anyone who gets in their way. One of the robbers notices that she doesn't move, looks at her in the face and shoots her in the chest. The young woman falls backwards spitting blood and with her bright eyes wide open as if asking "Why me?". The bank robbery has claimed its first victim. The robber doesn't flinch as he watches Rosi die on the marble floor. The story being told is real. Its the story of the most violent and dramatic bank heist in the history of the state of Sinaloa. For 24 hours, Mexico and the world watched as 6 men held dozens of hostages, threatening to kill them and blow up the bank. The ending to the ordeal was an embarrassment to a city and to a whole state. It happened when future Presidential candidate Francisco Labastida Ochoa was governor of the state and Ernesto Alvarez Nolasco was mayor of Ahome, Sinaloa. It was planned on March 25. That day, Mario Valdez, Ivan Camarena, Ramon Terrazas "The Frog", Gilberto Valenzuela, Catarino Felix and Guillermo Gonzalez met at a house to plan the heist. After agreeing on the type of weapons to use, they chose the date: April 20th. 12:30 pm, the time the Servicio Panamericano armored truck would make a drop at the bank. After shooting Rosi that April afternoon, one of the robbers rushed to co manager Manuel Sandoval Rendon and grabbed him by the arm, pushing him towards the vault in the back of the building. Inside of the vault, millions of pesos awaited: the men guarding the vault had earlier picked up the money from the Bank teller stations and stashed it in the vault and the armored truck had made the deposit earlier than previously thought. "Open the door!" one of the robbers screamed at Sandoval. "I cant! The door opens from the inside!" Sandoval replied. The robber in frustration proceeded to shoot the helpless co manager in the thigh and Sandoval fell to the floor in agony. The managers agony was being watched by head cashier Raul Rendon from inside the vault via closed circuit monitor. However he couldn't do anything but watch. At the first gunshots, he had activated the robbery alarm and the vault door had automatically sealed itself. The door couldn't be opened. 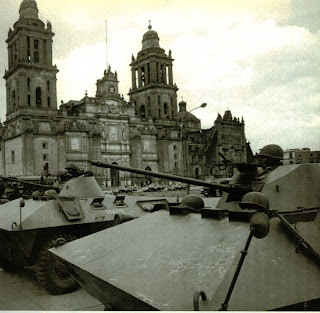 By that time the Mexican Federal Judicial Police and Municipal Police had surrounded the bank and closed the streets around the building. Hidalgo Avenue, Guillermo Prieto St., Zaragoza St. and Independencia St. were shut down and no one could drive through. The gunmen furious because they were now cornered with no money and no way out, they opted for taking the 60 plus customers and employees hostage. Seeing that the situation grew worse by the minute, a young Mexican Red Cross worker named Marco Antonio Estrada tried to mediate with the robbers. He proposed letting everyone go and he would remain as their sole hostage. The robbers ignored him. Then all hell broke loose. The police shot out a window on the corner of Guillermo Prieto St and Hidalgo Avenue and threw in a canister of tear gas. Then they opened fire. The gunmen holed up inside the bank returned fire and a shootout ensued. The shooting only stopped when the robbers yelled to the police they would kill hostages if they didn't stop shooting at them. Then they called a local radio station and demanded an armored truck to escape in, cash and a helicopter to flee the state. If their demands were not met they would blow up the bank and everyone inside with sticks of dynamite they had tucked in their jeans or they would simply start executing hostages. "Were capable of anything, we're not afraid to die" one of the robbers told the radio station, his words broadcast throught the city and nation. Minutes later as a show of good faith, the robbers released 3 hostages; manager Sandoval Rendon, the Red Cross Worker Marco Antonio Estrada and an off duty Judicial Policeman Roberto Soto Cruz. But the three men had a tragic end. Upon walking out of the doors, they were met with a hail of bullets. The police, mistaking them for the gunmen, had opened fire. The bodies of the three hostages lay dead on the sidewalk in front of the bank while other hostages inside lay wounded by the shooting. Overwhelmed by what was happening, Governor Labastida gave the order to comply with the robbers' demands. The order from the governor came precisely at the same time as a group of townspeople had gathered outside the bank and threatened to rush the building to protect the gunmen from the police! It was Thursday April 21st at 12:40 pm when the violence finally ceased. By then the authorities and robbers had come to an agreement. They would trade the hostages for 3 Red Cross paramedics, Rosario Angulo, Jose Lopez and Santana Ortega, and they would be allowed to flee. Outside a Servicio Panamericano armored truck awaited the men. National and International TV cameras were rolling as 5 robbers, wielding their guns and sacks of cash boarded the armored truck. The 6th robber lost himself among the crowd of onlookers and freed hostages. Then something uncanny happened. The truck didnt start. No problem. The crowd of onlookers and townspeople pushed the truck up the street, four blocks until the truck started. A grateful robber stunned everyone by cracking open a door and tossing a fistful of cash to the jubilant crowd. The robbers abandoned the armored truck in the Vicente Guerrero neighborhood and fled on foot, aided supposedly by people who lived in the impoverished neighborhood. After the heist, the city and nation asked itself. Who was responsible for the slaying of the hostages? The Chief of police of Los Mochis, Joel Velasco Flores blamed the gunmen. Others blamed the bumbling police. Even though people mourned the deaths of four people that warm April day, Rosi Padilla's death was the most dramatic. Nobody knew that April 20th would be the last day of her three month job contract at the Banamex bank. Nobody also knew that months before, she had worked at the Banco Serfin bank on Leyva St. and had been a witness to a robbery at that bank. Two of the six men robbing the Banamex bank on April 20th had participated in the Serfin hold up and they recognized Rosi from before. That earned her a bullet to the chest. Weeks later the robbers were arrested. One in a hospital and the rest were apprehended individually at their hideouts in Navojoa, Sonora. In 1990, the drama was brought to the Mexican big screen in "Bancazo en Los Mochis" (Heist in Los Mochis), starring well known Mexican soap opera actor Eduardo Yanez as one of the robbers. A corrido was also made, retelling the events at the bank. 21 years have passed since the violent robbery at Banamex in Los Mochis, but for the people involved, hostages and police alike, its a memory that will never go away for a simple reason. Too many innocent people died that day. The 12 story Nuevo Leon apartment building lies wrecked. More than 400 perished there. The sprawling metropolis of 20 million people is slowly coming back to life. Shops are opening, classes are about to start. Men and women get ready for work. Children eat their breakfast before starting another school day. The mariachis at Plaza Garibaldi are turning into their apartments, finally getting some shut eye after playing all night for drunken revelers. Independence Day was three days ago, time to get rest. The night shift at Juarez Hospital is getting off and the morning shift is just arriving. Doctors and nurses mill about, newborns cry in their cribs and patients lie on their beds. Guests sleep inside their rooms at the luxury Hotel Regis. Nearby, Joggers sprint by in Alameda Park. The morning rush hour is about to begin. Hundreds of miles away in the Pacific Ocean, off the coast of Michoacan near the port of Lazaro Cardenas, deep beneath the earth's crust, two tectonic plates collide, rock and earth crashing and gnashing, producing the energy of dozens of atomic bombs. Hell is about to be unleashed in central Mexico. A deep rumbling sound rolls over the mountains of Jalisco and Michoacan, then a jolt, then shaking. Slow at first then becoming more violent. The people gathered for morning mass inside the main cathedral of Ciudad Guzman, Jalisco scream and pray to the Lord to have mercy. The priest, struggling to stay on his feet, yells at everyone to gather near the church's massive stone pillars. Then the two bell towers crumble and fall on a dozen people, the first victims of the massive quake. A mountain slides away and buries a dozen farmers in nearby Atenquique, a dozen adobe homes collapse in Jalisco, Michoacan and Guerrero. A multi-story resort hotel in Playa Azul, Michoacan collapses. Power is knocked out to Guadalajara. "Do not panic, ill give you the time, 7:19 am, a quake is being felt in Mexico City, light shaking..."
Then the show is knocked off the air. Televisa Chapultepec's main transmission tower has crumpled, collapsing the huge News Department building and burying a hundred people. Motorists on Paseo de la Reforma stop their cars and scramble out of their cars. They see the skyscrapers that line the avenue shaking and swaying, some buildings actually smashing into each other. Broken glass and concrete dust falls to the sidewalks. They lean on their cars and hold on to their open doors as to not fall while the ground heaves. Students cry in terror as the CONALEP college comes crashing down. Hotel Romano near CONALEP also collapses, its floors pancaking down and crushing people in between. Crowded Super Leche cafeteria breaks apart and completely collapses, the famous diner now a pile of broken concrete and bodies. Two of three wings of the 12 story Nuevo Leon apartment building collapse, people screaming as the building falls over backward and comes crashing to earth. Nurses,doctors and patients scream as Hospital Juarez sways and all 12 floors collapse one atop another and finally fall to earth in a huge cloud of dust. The seven story Gynecology wing at General Hospital also collapses, entombing newborns and mothers. The steam room at the historic Hotel Regis explodes, and the building collapses, entombing hundreds of guests. The shaking finally stops. People on the outskirts of the city wonder what has happened, they felt a slight tremor, probably nothing of importance. However an ominous sign: All television stations are off the air. People downtown begin to survey the damage. Downtown Mexico City looks like a war zone. Hundreds of buildings have collapsed. Thousands of people are trapped. The smell of smoke and dust fill the air. Broken glass and crumbs of concrete litter the streets. The subway is paralyzed. Commuters get off the stopped trains and orderly file out of the tunnels and stations. The radio stations begin to report what has happened. This is no small tremor. This is starting to look like a major catastrophe. There is no power downtown, no water. Radio reports say Televisa has collapsed. 77 are dead there. Hospital Juarez is now a monstrous pile of rubble. General Hospital has fallen. Many government buildings are piles of rubble now. The Ministry of Communications and Transport building's top floors collapsed and its microwave antenna useless.40 are reported dead there. The Federal District Attorney General's Offices also were destroyed. The American Airlines Headquarters building next to the National Lottery Building had its top 8 of its 12 floors crunch down and only 4 remained. 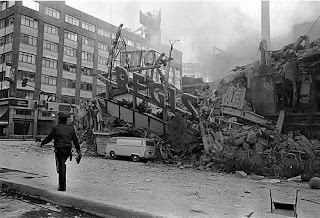 The Ministry of Labor and Social Protection on Dr Vertiz Street was wrecked. The old building housing the city's telephone and telex lines on Victoria Street was destroyed. The city was without communication to the outside world. Burger Boy Restaurant on Belisario Dominguez St. was ruined. So was the notorious La Palestina Bar near El Zocalo. Several Cinemas and Theaters were reduced to broken masonry and steel. The Ministry of Protection and Traffic Safety has practically collapsed in its entirety. The Ministry of Commerce and Industrial Development (SECOFI) is "like a crumbled cookie". The two towers of the Civil Courts on Ninos Heroes Street are leveled. Seven substations of the Federal Electrical Commission lay wrecked on the ground. Several condominium high rises in Colonias Roma, Narvarte and Doctores, were huge piles of broken concrete and steel. Hotel Principado on Jose Maria Iglesias Street near Monument to the Revolution collapsed, the only survivor being a baby that miraculously crawled out of the rubble and fire. 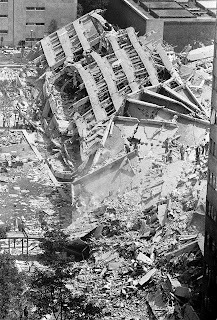 The De Carlo Hotel, the Principados neighbor, collapsed in the middle with the top part of the building leaning back and spilling bed, mattresses and people out to the street below. The Del Prado Hotel , next to the crumpled Ministry of the Navy, had to be evacuated due to serious damages: Diego Riveras famous mural in the lobby was undamaged. Hotel Versailles was smashed. The Roble and Alameda cinemas were no more. The 21 story Pino Suarez building is lying wrecked on the street. The Latinamerican Tower, Pemex Headquarters and the Mexicana Airlines building are still standing. Hotel de Mexico, one of the cities' tallest buildings is undamaged. Three huge apartment buildings in the Multifamiliar Presidente Juarez are monstrous piles of debris, A1, B2, and C3 have completely failed and several dead and injured are trapped in the debris. The Banamex building is down and the top floors have pancaked onto the lowers on the Atlas Building near Super Leche. The top level of La Merced market had fallen onto the lower level, flattening cars. 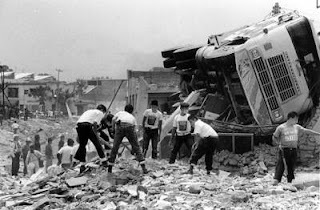 Several sweatshops on San Antonio Abad Avenue have collapsed into huge mounds of rubble entombing dozens of seamstresses. The apartment buildings housing several Mariachi band members barely going to sleep after playing all night at Plaza Garibaldi have also turned into a collective tomb for the people inside. The National College for Professional Education, CONALEP is a pile or rubble with dozens of students trapped or dead. Residents, taco vendors, street sweepers and taxi drivers begin to swarm over the collapsed buildings, searching for signs of life. "Anyone here? Anyone alive?!" 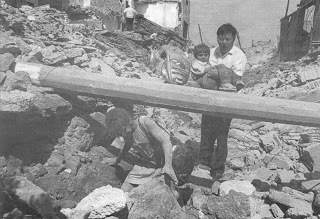 Survivors are pulled out of the rubble by neighbors using their bare hands. Jacobo Zabludovsky, Mexico's famous 24 Horas news anchor, is now driving through the devastated city, using his car phone to describe to viewers and listeners what he sees. Driving by Televisa Chapultepec he utters the words "the place where I work, the place where I spend more hours than my own home, is gone, destroyed. This is the worst catastrophe to befall this city ever..."
The iconic Angel statue, toppled during a 1957 earthquake, remains atop the column on the traffic circle on Reforma Ave.
Hotel Regis is now on fire. The walls of Colegio San Juan Bosco have caved in, killing the Chemistry teacher and her 25 students. The government gives a gross understatement to the press. 26 are dead in Mexico City. Other sources claim the death toll will reach 1000. Locatel reports 28,000 people are missing, more than 5000 are injured and flooding the city hospitals. Hospital Balbuena asks that no one be sent there anymore: it is filled to capacity. State TV says that 1500 are dead in Colonia Roma alone. Funeral Homes declare they can handle no more bodies. President Miguel De La Madrid walks through the ruined city. Walks by Hotel Regis and announces that "Mexico is shaken but has not fallen, we are prepared to handle any disaster, we are self sufficient." The General Ministry of Protection and Traffic Safety announced that 6,299 cadavers had been recovered. Many are being held at a soccer stadium. Another 700 in the Forensic Medical Services coroners office. Bodies are being taken by the dozens to the offices of the following boroughs: Cuahutemoc, Venustiano Carranza, Benito Juarez and Iztacalco. Relatives should come claim them otherwise they will be buried in a mass grave in 36 hours for health reasons. Reports on radio and TV stations that have a signal say 150 are killed in the state of Jalisco. The cathedral in Ciudad Guzman has crumbled on top of the parishioners during morning mass. Part of a mountain has "slid away" in the village of Atenquique, burying several farmers on their way to their fields. Power is out in some parts of Guadalajara. No communication out of some villages in Guerrero and Michoacan. A wave is said to have swept the harbor at Lazaro Cardenas, Michoacan. Sounds like the world is ending in Mexico. Foreign Aid is being offered by various countries. Mexico is denying all foreign aid at this time. Relief planes are landing at Mexico City after its runways checked for damage but are being held on the tarmac. Bureaucracy at its finest. Rescue workers arriving with tools at the airport are subject to inspection at Customs. Valuable rescue time is wasted while the foreign rescue teams are held at the airport. The Government of the Federal District by decree of Mayor Ramon Aguirre declares all public functions in the city closed. Movie Theaters and other public areas are to be closed the night of the 19th until further notice. The people rescuing others at various ruined buildings are now being kicked out by the army. Mexico City officials declare that they have no "rescue expertise and are therefore endangering their own lives and the lives of others". Many impromptu rescuers defy the orders and continue digging in the rubble. Several altercations with soldiers ensue. Rather than help, the army is in the way. "Instead of waving your rifle why don't you grab a shovel and make yourself useful?" someone shouts. The soldier glares at the man. The army is deployed in the city of 18 million to prevent looting. Several soldiers are seen taking jewels and money out of ruined homes. Anything of value that is not broken is being loaded into cars by men in suits who look like Judicial Police officers. TV sets, microwaves, blenders. The thugs glare at the rescuers and look around as if saying "nobody saw anything, everyone keep quiet". Then they leave. Night falls. Rescue work still goes on. Pulling out the dead and the living. Newborn babies are being rescued alive from the ruins of Hospital Juarez, General Hospital and National Medical Center. Whats left of Hotel Regis and Salinas y Rocha Department store is a blackened, burned shell. Hundreds sleep outside for fear of further collapses or another earthquake. Mexico's National Seismology Center reports: The earthquake was magnitude 8.1 on the Richter scale centered near the mouth of Balsas River in Michoacan state. The quake was felt as far north as Los Angeles and Houston. An earthquake expert declares that since the quake was huge and let out a lot of energy there will be no more big quakes following this one. People can relax. Next day, at 7:40 pm, a magnitude 7.8 quake hits an already battered Mexico City. More buildings collapse. Rescuers are killed or injured. Weeks go by. Between 10,000 or 20,000 are dead. The final toll is unknown many bodies are being buried in mass graves. Others are being picked up along with rubble by the construction equipment brought in to clear the ruins and clear the streets as soon as possible. Hundreds still sleep outside in tent cities. The government promises shelter and money to those who lost everything. 24 years later, many of the survivors are still waiting for that money and that shelter.